The Royal Doulton company first began in London during 1815 and has since become a global brand that produces some of the most well known and loved porcelain, dinnerware and collectable pieces. Throughout the ages there have been a variety of different stamps used to mark authentic Royal Doulton ornaments and tableware. In saying this, almost all Royal Doulton items will have either a back stamp or marking that can be found on the bottom of the item beneath the final glaze. John Doulton, a qualified manufacturers joined with John Watts, a foreman and Martha Jones, the Lambeth Pottery owner in 1815. They began producing pottery in a small factory in England trading under the name ‘Jones, Watts and Doulton‘. Their speciality at this time was salt glazed stoneware. During 1820, Martha broke away from the company although it wasn’t until 1826 the two remaining owners changed the company name to ‘Doulton & Watts‘. The company had increased in popularity and to meet this demand the two men moved the company to a larger factory. Eventually, John Watts retired from the company in 1854 which was then trading as ‘Doulton & Company‘. In 1873 when John Doulton passed away his son, Henry took complete control of the company. By 1885, the Doulton company had risen drastically in popularity and was now becoming well known to the British Royal Family. In 1887, Queen Victoria knighted Henry Doulton for his contributions to the ceramic art and then later in 1901 King Edwards VII gave the company a Royal Warrant. 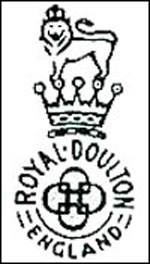 From this Royal Warrant the company was then able to trade as ‘Royal Doulton‘, the name we are familiar with today. The majority of the ornaments and dinnerware are now made in Indonesia. A small percent of higher-quality porcelain pieces are still made in the company’s home town, England. Due to the shift in quality of the Royal Doulton company, older pieces can often be worth a small fortune. The earliest Royal Doulton pieces sometimes have backstamps that read ‘Pinder Bourne & Co’ or have simple initials such as P.B or P.B & Co. Later backstamps from 1882 have definite logos and wording which can be found below. During this period a number of simple stamps were impressed into Royal Doulton works of art. These impressed markings would read: ‘Doulton & Watts’, ‘Doulton & Watts Lambeth Pottery London’, ‘Doulton Lambeth’ and ‘Doulton Lambeth England’. Towards the end of this period the impressed words were bordered by an oval shape which slowly turned into the rounded shape in the backstamps to follow. During this period, the simple Doulton Burslem England stamp with four interlocking ‘D’s was common on Royal Doulton pieces. The word ‘England’ that appears below this stamp was not added until 1891. A royal crown was added above the initial logo to mark the meeting between the company and the Prince of Wales. The logo with the royal crown was used especially on bone china and expensive earth wares. Both of these logos were used until 1901. 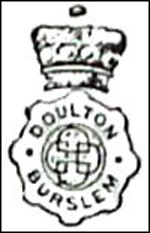 During this time periods, the recognisable Doulton logo was introduced. This logo consisted of the lion, crown and roundel. All three of these symbols are often associated with the company. This backstamp still included the four interlocking ‘D’s although the crown appeared less detailed than the one used in previous stamps. In this 5 year period, a backstamp was used that is similar to the previous stamp although is missing the crown. It is thought this stamp was introduced as it was smaller in height and could fit the wares that were being produced during that period. This mark was not widely used. The marking that appeared on pieces until1922 was used again. This marking included the lion, crown and roundel. A year of production was also included in this new stamp. To find the year of production, you would need to add 1927 to the number that appears next to the backstamp. From approximately 1930 the words ‘Made in England’ appear just below the crown. The date numbers were included until 1936. The words ‘Bone China’ are also part of the backstamp for those pieces created from Bone China. ‘Fine China’ was the wording used from 1973 and can be found on Royal Doulton ornaments that are produced today. The exact date when this new backstamp was introduced cannot be confirmed although it is believed it first appeared between 1993 and 2000. This new stamp can be found on tableware’s produced in the present time. This backstamp has the lion logo, although also has the words ‘Fine China Made in Indonesia’ or ‘Bangladesh’ along with a copyright date. This backstamp is a modernised version of the previous stamps used by the company. 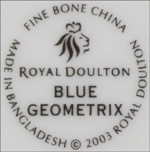 Special marking and backstamps can be found on specific collections produced by the Royal Doulton Company. Special Royal Doulton series ware marks are present on a number of collections. These are designed specifically for that collection and the logo represents that directly. Some collections a speciality ware marking is apparent include ‘Under the Greenwood Tree’, ‘The Gallant Fishers’ and ‘Home Waters’. A range designed for young children features its own unique mark. 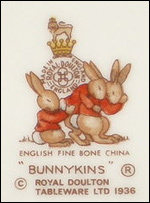 All Bunnykins ware has a logo that features three bunnies and the words “Bunnykins”. 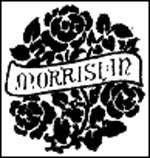 A special marking for Morrisian Wares used between 1901 until 1924. Titanium wares produced between 1916 until 1933 have their own special marking that reads ‘Royal Doulton Titanium England’. The words ‘Royal Doulton Flambe’ appeared on early Flambe works of art. If you are lucky, your Royal Doulton piece may have an impressed date next to the trademark stamp. These impressed dates can come in the form of year, month and year and day, month and year. Sometimes these impressed dates are hard to see so insure you inspect your Royal Doulton item with a fine tooth-comb. Code numbers were printed on the base of Royal Doulton produced between 1928 until 1954. These numbers appear next to the right of the crown. The rule of thumb with these numbers is to add 1927. For example, if your inked number is ‘1’ the year your item was manufactured in 1928. Until 1930 roman numerals were used to display this number and from 1930 until 1954 Arabic numerals were used. Some Royal Doulton items have a latte number impressed in their base. These numbers were when the mould was created not the particular piece. Although not an exact date, a round about date can be worked out from this year considering most moulds would deteriorate quickly. The copyright date of a Royal Doulton piece is not the best indication of age. A piece that has a copyright date of 1937 can be produced until 2004. 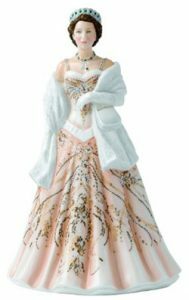 The production of the figurine generally begins one year after the copy right date but that isn’t to say that is the year your piece was produced in. 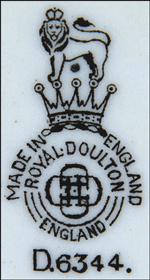 Another marking that can be found on a Royal Doulton ornament is the artist’s mark. There have been hundred of artists that have worked for Royal Doulton over its lifespan. Each artist has a unique signature that usually represents their initials. For example, the artist Louisa Ayling uses a simple ‘a’ as her mark while Mary M Arding marks pieces created by her with ‘M.M.A’.